Anime Limited will be bringing the currently airing Sword Art Online: Alicization to home video in the United Kingdom & Ireland, the distributor announced at their MCM London Comic Con panel today. 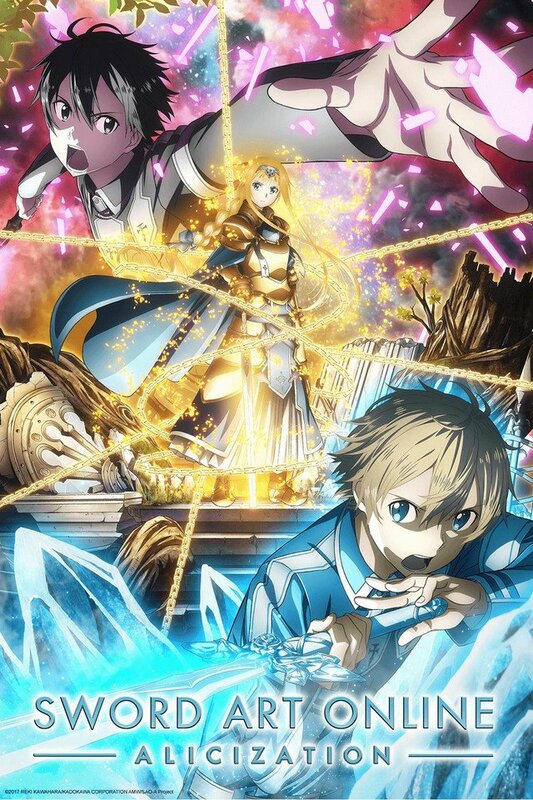 The third television anime adaptating Reki Kawahara’s popular light novel series, Sword Art Online: Alicization follows on the events of Sword Art Online II and the theatrical feature Sword Art Online the Movie: Ordinal Scale, as Kirito finds his consciousness transferred to an experimental, lifelike virtual reality world: Underworld. Before he knows it, Kirito has made a full-dive into an epic, fantasy-like virtual world. With only a murky recollection of what happened right before he logged in, he starts to wander around, searching for clues. He comes upon an enormous, pitch black tree – the Gigas Cedar – where he encounters a boy. “My name is Eugene. Nice to meet you, Kirito.” Although he is supposedly a resident of the virtual world – an NPC – the boy shows the same array of emotions as any human being. As Kirito bonds with Eugeo, he continues to teach for a way to log out of this world. Meanwhile, he remembers a certain memory deep down within him. Manabu Ono (The Asterisk War) is taking over as director of the series at A-1 Pictures (Sword Art Online the Movie: Ordinal Scale). Yoshitsugu Matsuoka and Haruka Tomatsu are set to reprise their roles as Kirito and Asuna, respectively, with Ai Kayano (No Game No Life) joining the cast as Alice, and Nobunaga Shimazaki (Black Clover) as Eugeo. Sword Art Online: Alicization is currently airing and is available for streaming on Crunchyroll, with new episodes released every Saturday. Another new gaming technology comes along, and once again Kirito is there to sort out the terrible problems it causes him and Asuna. Announcing the Anime UK News Readers’ Choice Awards 2018 Winners! The votes are in! The top anime and manga of 2018 have been decided by fans, but did your favourite make it into the Anime UK News Readers Choice Awards 2018? MCM Scotland Comic Con will host the premiere of the highly anticipated Sword Art Online: Alicization anime sequel this month, ahead of its October broadcast.